Mr. Emmanuel O. Akonnor and Emmanuel K. Ayisi presented on the topics; “Public-Private Partnerships in Solid Waste Management: The Case of Accra Metropolitan Assembly” and “Social Capital and Public Policy implementation: The Experience of Ghana’s National Health Insurance Scheme (NHIS)” respectively. Mr. Akonnor’s study sought to address the challenges in Solid Waste Management. He noted that failure of the Accra Metropolitan Assembly (AMA) to include households in the franchising typology of the Polluter Pays Principle (PPP) Agreement had affected its effectiveness. His study looked at the institutional arrangements that underlie the PPP arrangement by the AMA, the main roles played by the various actors in the partnership and also assessed the successes as well as constraints of the PPP. Mr. Akonnor employed a qualitative research design via an interpretivist paradigm in conducting his study. The population of the study consisted of AMA officials, contractors and householders who were purposively selected for the study. Mr. Akonnor in his work recommended that households need to be engaged in the agreement to ensure their cooperation in the PPP arrangement. He was supervised by Prof. K.A Domfeh, Dr. Richardson Azunu and Dr. Thomas Buabeng. The candidate, Mr. Emmanuel Kofi Ayisi’s study investigated the forms of social capital (SC) in selected communities in Ghana and how they influence the enrolment decision. 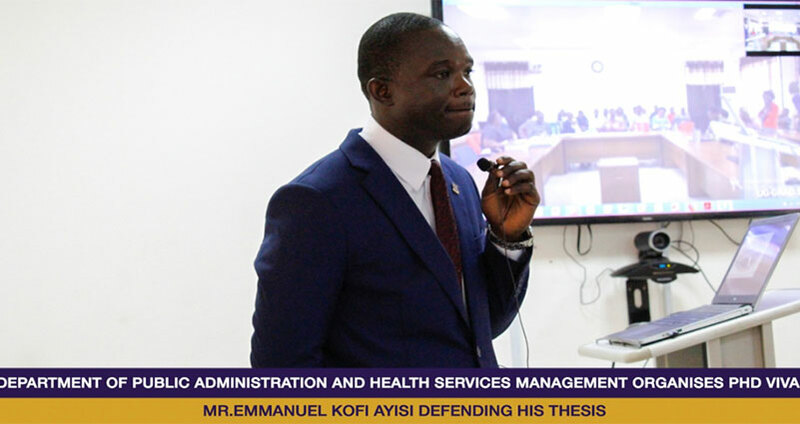 His study also explored how SC structures in the selected communities could be leveraged to drive enrolment in Ghana’s National Health Insurance (NHIS). Situated in an interpretive paradigm, Mr. Ayisi’s study adopted a qualitative research methodology with semi-structured interviews, focus group discussions and documentary reviews as the key data collection tools. The data gathered was analyzed thematically in a six staged process. The study established that Social capital facilitates enrolment decisions in three main ways; bonding, bridging and linking. Mr.Ayisi advocated for the use of organic solidarity which exists within indigenous structures, to improve enrolment on the NHIS. He was supervised by Prof. Justice Bawole and Dr. Lily Yarney. Both candidates were passed by the examiners based on three parameters; demonstration of knowledge in the field, contribution to academia and demonstrated ownership of their works. The candidates acknowledged the almighty God, their supervisors and mates for their help and support.